The Profitmaster website links seamlessly with the mainline Profitmaster package, making it easy for you to sell your products online. The Profitmaster website is constantly refreshed with any changes made in the Profitmaster database. Your staff just carry on doing their normal jobs, and the website automatically reflects the up-to-date stock availability and prices. Orders can be taken for credit/debit card sales, account customers or both. They are automatically imported into the Profitmaster order files, and may also be fed directly to the warehouse for immediate picking and despatch. "The overall "look" - layout, colours etc. 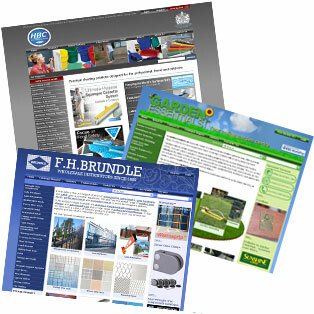 - is the most obvious difference between our clients' websites. It's what customers and potential customers notice first, so it's important to get it right." Our demonstration website now incorporates a theme switcher so you can see that every part of our websites layout can be adjusted to your specifications. View our demonstration site in "Classic Blue" or "Fresh Orange". You can switch between these themes by clicking the relative link in the footer of the page. Profitmaster websites include online searching, grouping of products into web groups, news pages, and a flexible content management system. They can also be integrated with 3rd party analysis tools such as Google Analytics and traffic generation services such as Google Adwords & Kelkoo. For more information see our website brochure or contact us and we will send you a brochure in the post. You can also see a working model of our websites either by viewing one of our customer sites or by viewing our demonstration website.